Stir fry the onion, the carrots and the ham for 5 minutes. Add the stock, the lentils and the thyme, bring this to the boil and simmer for 25 minutes. Serve with sour cream and grated cheese. 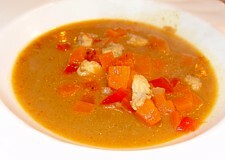 This soup is served for New Year, since the lentils represent the coins one so hopes to earn. Some countries have the same habit, whilst others go for the big money and serve green leafy vegetables, for bank notes. On Worldcook's New Year page you will find New Year recipes from all over the world. Click on culinary calendar for more links between tradition and cooking. 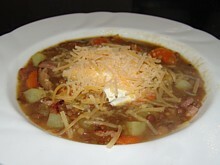 See also recipes for Chilean lentil soup, Spanish lentil soup and Turkish lentil soup. Heat some oil in a frying pan and add the curry paste, stir fry for 2 minutes. Add all ingredients except the fish and bring this to the boil. Simmer for 20 minutes. Add the fish fillet and simmer for 5 minutes more.